Supporting illustration, comics and making the public discover the richness of creation in these fields. This year Blutch will be making a much-anticipated appearance and going all out to make up time, drawing in dialogue with Anne-Margot Ramstein, sharing his carte blanche pick of films at the Cinema Star, before participating in a round table at the Salon des Independants. Over thirty Finnish, Spanish, Belgian, Swiss, French, regional and local publishers will be present their printed matter. On the exhibition side, we welcome the following new venues; CEAAC will be showing illustrations and comics by Antoine Maillard back from a residency in California, La Bouquinette showcase Amandine Laprun's children’s illustrations, KALT will be throwing an electro party and work by two upcoming collectives, Art Majeur and Passe En Profondeur. CV9 invites you to sunbath on the East Coast in the light of a premier showing of graphic art from East Europe: watch out for Le Montrealer at the Bruche à la Locomotive in Wisches, Première Pression À Froid’s graphic creations at My Monkey, Nancy and the unclassifiable Gianpaolo Pagni, invited by Modulab, Metz. Voir le site du Festival arrow-18-icon Created with Sketch. Télécharger le programme (.pdf) arrow-18-icon Created with Sketch. The festival treacherously organizes a British invasion in 2018, before Brexit complicates everything. It starts with an eccentric Dialogue de Dessins (Drawing Dialogue) with three illustrators, including a Scottish Englishman, Marcus Oakley. 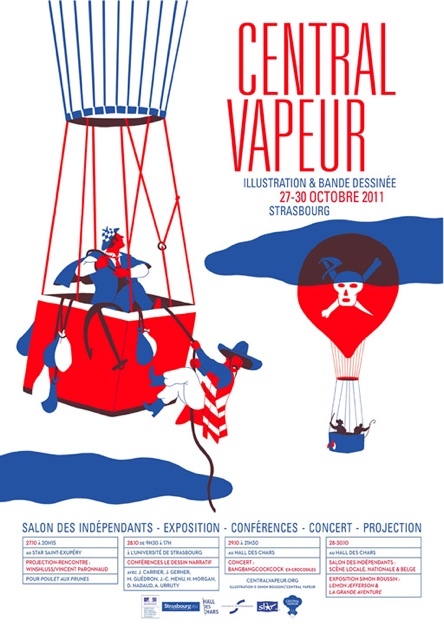 This exhibition will mark the opening day of the vernissage of the Rencontres de l’Illustration of Strasbourg, form Thrusday 15th March. It continues with an exhibition of the most British Laxovian illustrators Peter Allen, with a Pro session in partnership with the Association Of Illustrators, and a publishing fair which will bring together international illustrators like Nobrow and artists like Dominic Kesterton. 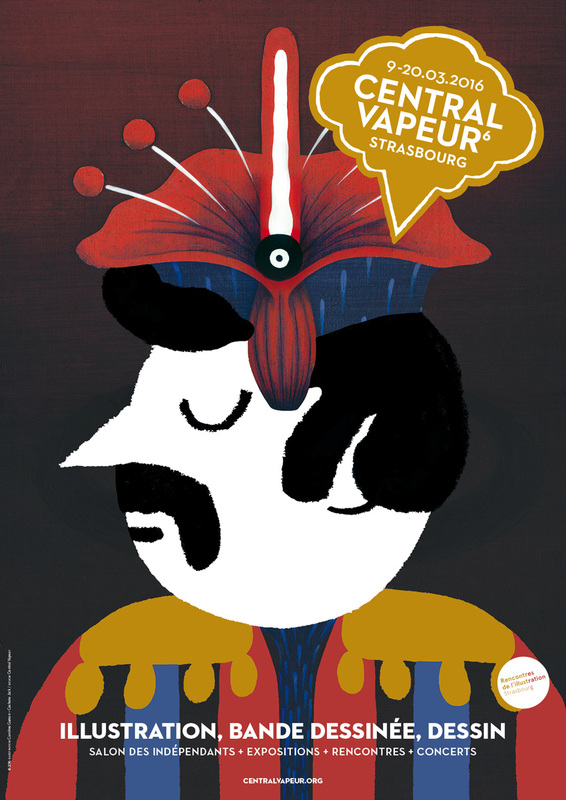 Vincent Vanoli will make a return on his years across the Channel with an exhibition, while college and high school students of Alsace will be invited to a postcard contest “So Bitrish” organized by the Academy of Strasbourg, Topo magazine and Central Vapeur, which will expose them during his publishing fair. Established in the Salle de la Bourse for the first time, the publishing Fair will also welcome the Danes of the CPH Zinfest, our more or less counterpart of Copenhagen, the universal minimalist José Parrondo, the Dernier Cri that who will also exhibit posters and serigraphies at AedAen, 10 years after coming to Molodoi, with Juliette Etrivert. There will also be Sandrine Thommen’s youth exhibition, Adrià Fruitos’ drawings for the press, and the collective exhibitions : CALC, Mökki, L’Ennui… And the final touch of the Diamond, with the vernissagein extremis of the exhibition Fabio Viscogliosi & Luca Retreat. Gourmets will not miss Friday’s Battlestar with guests from far away and a beer labels illustrations contest (ended January 4, 2018). 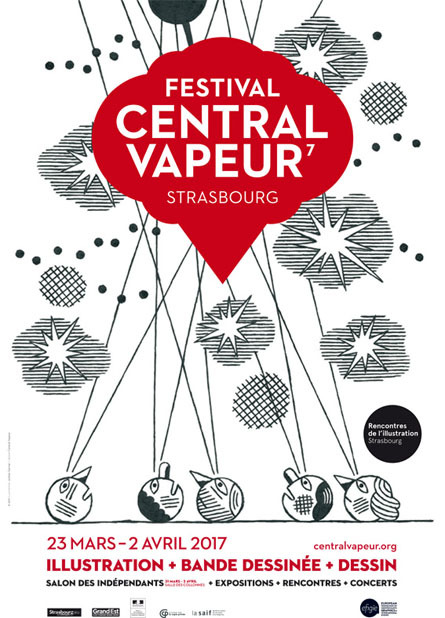 The festival renews its support for the Rencontres de l’illustration de Strasbourg by making an important contribution to the programme of events being offered by the town’s museums, libraries and the HEAR art school. A long time overdue, our original project to showcase illustrators working in Nancy has since transformed into a bigger and better Grand Est edition. Look out then in the festival for the many collectives working in the region from the Vosges, the Ardennes, Metz and far away… to the very depths of Hell where the diabolical duel between the patron saint Jochen Gerner versus Guillaume Chauchat falls under the spotlights of this year’s Dialogue of Dessins, the champions of style are ready for the off, their Rouergue suitcases packed with pyjama(ramas) by Frederique Bertrand. 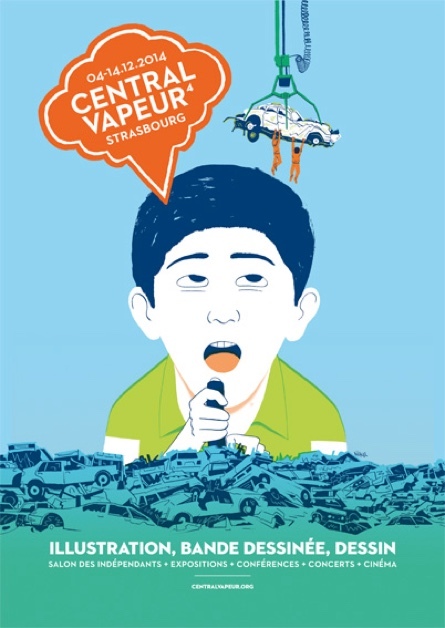 Further away still, Dans le Ciel Tout va Bien is contributor to a number of different projects, without forgetting the mighty Benoit Jacques along with his little publishing house. Paris, Moscow, Berlin the journey continues… onwards through space, the final frontier, to the Battlestar, to see the reigning champion, Matthias Picard defend his title. But as the saying goes: Power is fleeting, Love is eternal. The festival will shortly be celebrating its last christmas before a change of season in 2016 to a new date in march. There will also be some changes to the various locations used during the Festival as the redevelopment of the former Friche Laiterie / Hall des Chars site has led us to seek alternative spaces. Consequently, The Drawing Dialogue / Dialogue de Dessins between Tom de Pékin and Pierre Faedi will be taking place in the black-room that the Kafteur has kindly lent us for the occasion. October Tone will be organising this year’s concerts just a stone’s throw away from the Salles des Colonnes where the Festival will continue to be held. Guests include : our old friends l’Articho and Les Requins Marteaux, Kiblind magazine and a venture into their graphic world, children’s book publishers Les Fourmis Rouges, Bülb Comix’s box in a box, the rebels from Lyon Mauvaise Foi, Collection review’s exacting selection of contemporary drawing… on the home front, 2024 will be parading their stars, alongside left-field publishers Papier Gâchette, new faces and old, familiar ones like l’Institut Pacôme who’s farewell we will be wishing on sunday. 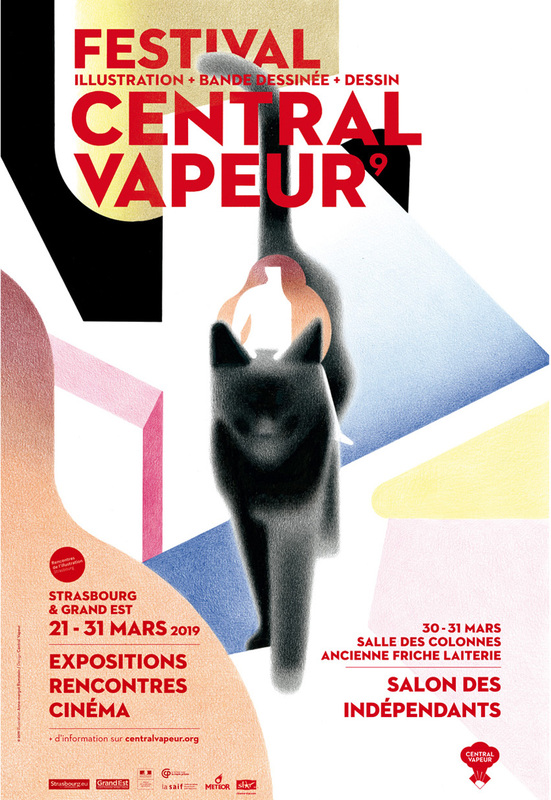 As for exhibitions, there will be plenty to discover, Violaine Leroy’s graphic novels, Delphine Harrer and Anna McKeir’s tattoo parlour, and a full programme of pro sessions and discussions taking place at the Maison de la Region. As for the next round of Battlestar Drawings we ask you to wait just a bit longer until the 12th of March and next year’s successor CV6, that runs from 10 to 20 March 2016. 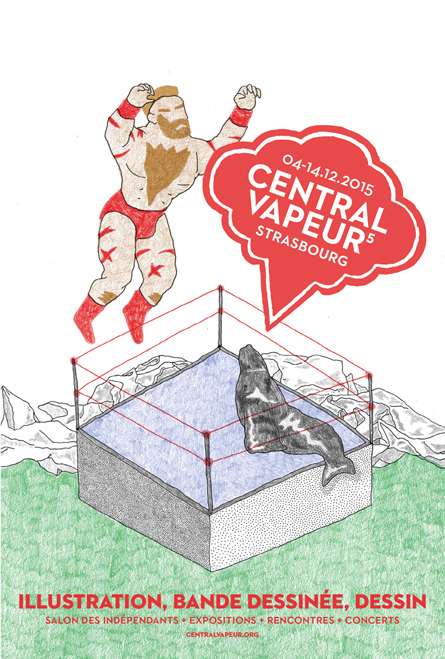 The full programme for Strasbourg's illustration, comics and graphic art fair. The gourmets among you won't want to miss the climax of the opening weekend, the second edition of live film-drawing duel taking place at Star Saint-Exupéry cinema and Panimix's concert programme for the following weekend. A fresh, contemporary view of illustration, comics and drawing, not just for kids but for everybody. 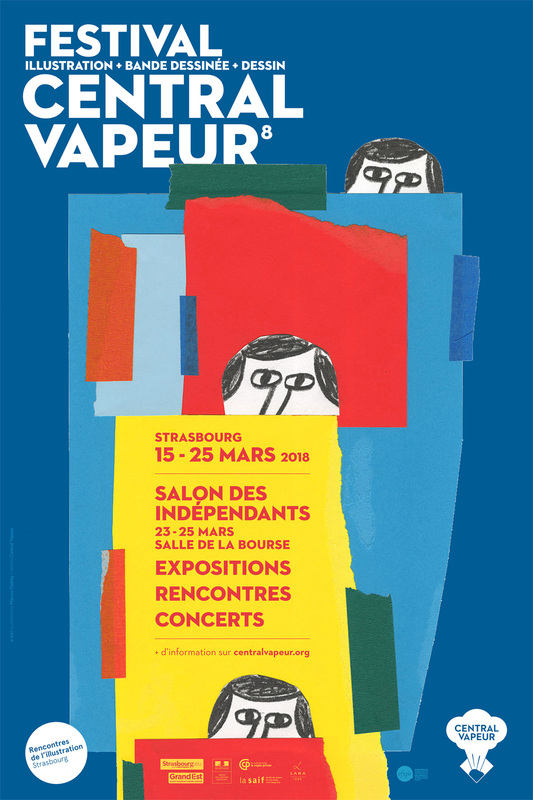 A third edition of Central Vapeur with a Germanic trend : 3 German collectives present in the Salon des Indépendants and a concert "von Berlin". A big first for the festival: a battle of drawings on the theme "cinema", before smoothly ending the second week-end. 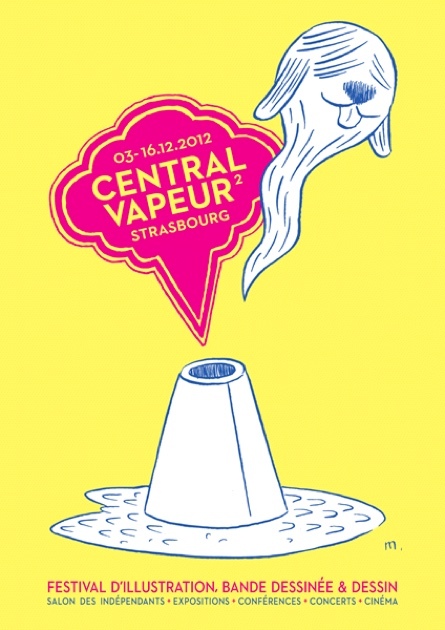 For the second edition, the festival Central Vapeur proposes a route of exhibitions and events through the city. Present the best of local illustration and comics creation and put it back into the national and European context. Stay concentrated without being locked into a narrow definition of these arts. Be interested in the similar initiatives in our margins in order to better define our territory, liven it up with the complicity of other arts such as music or cinema, create a circulation throughout the city and between the public.